One-of-a-kind superior-quality property with three bedrooms and two bathrooms. 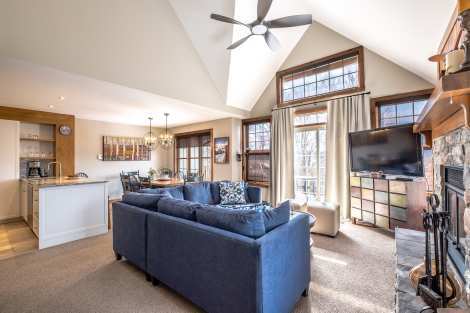 Recently renovated and updated, this beautiful residence is a Tremblant Resort Village favourite. Lucky are those who get to stay there! To start with, the cathedral ceiling and generous window arrangement create an impression of space and light. The main room with its wood burning fireplace comfortably accommodates guests, be it in the living room, at the counter or around the table. The bright open kitchen lets you prepare great meals as you would at home. The comfortable and tastefully furnished living room is equipped with a television with cable and a DVD player, as well as a compact sound system with radio. The large master suite is the only room on the second floor and it includes a stunning full bathroom, TV with cable. The second bedroom is large and furnished with a Queen bed, and the third bedroom offers 2 bunk beds. A bathroom with shower is located near the bedrooms. A balcony with barbecue extends the living space.